Christmas is almost upon us and Peter and I are looking forward to a relaxing day tomorrow - lots of emails and phone calls to and from friends and family and tomorrow night our traditional roast turkey - it's far too hot now to have it at mid-day, although lots of folks do, and many more will be tucking into cold seafood instead which is probably much more sensible in the far north of Australia! But I was brought up having cold Christmases and hot Christmas dinners in the UK so I guess old habits must die hard! Was hoping to be able to post a lovely colourful shot of a Buff-breasted Paradise Kingfisher but they continue to elude me! On my walk just now a magnificent one landed in a tree just in front of me but by the time I'd realised it was there it had gone again. 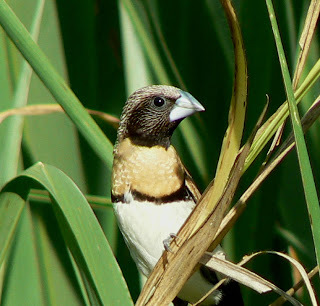 But then this little Chestnut-breasted Mannikin landed on a grass stem and happily posed for me - pretty little things, only about 11 cm (or 4 in) and usually seen in small flocks swooping for insects amongst reeds and grasses. So to everyone who celebrates Christmas we hope you have a lovely happy day tomorrow.